I recently received a challenge from Bon Appetit to create a meal that costs under $10 using items exclusively from ALDI. I’ve heard of ALDI and have passed by one over the years but never ventured in so this was a new experience for me and I didn’t know what to expect. ALDI is a supermarket that prides itself on selling quality ingredients at low prices. Some of the ways that they keep the costs low by are having you bring your own bags or buying reusable ones and by requiring a quarter deposit for carts which you get back once you replace the carts after shopping. I also like the fact that there’s no need to clip coupons or use a club card in order to receive the sale price. What I noticed while shopping was that there were many of the same items that I see in the other grocery stores for less. I also saw brands that I didn’t recognize; I did try a few new products and found that the quality was the same or even better than the regular supermarket. What I do want to point out is that you won’t find everything on your shopping list at ALDI but it is worth taking a trip to buy some of the items that they do carry. Next, it was time to shop around and pick up items for my $10 meal. I decided to make one of my go-to meals that I typically make when I’m really don’t want to spend too much time in front of the stove. 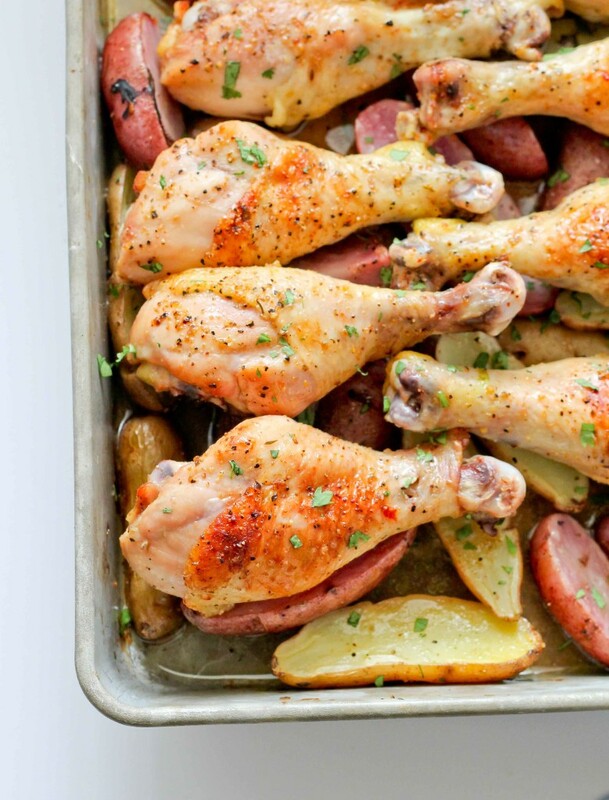 With just 5 ingredients, roasted chicken legs with fingerling potatoes were as easy as it gets and it kept me under budget. 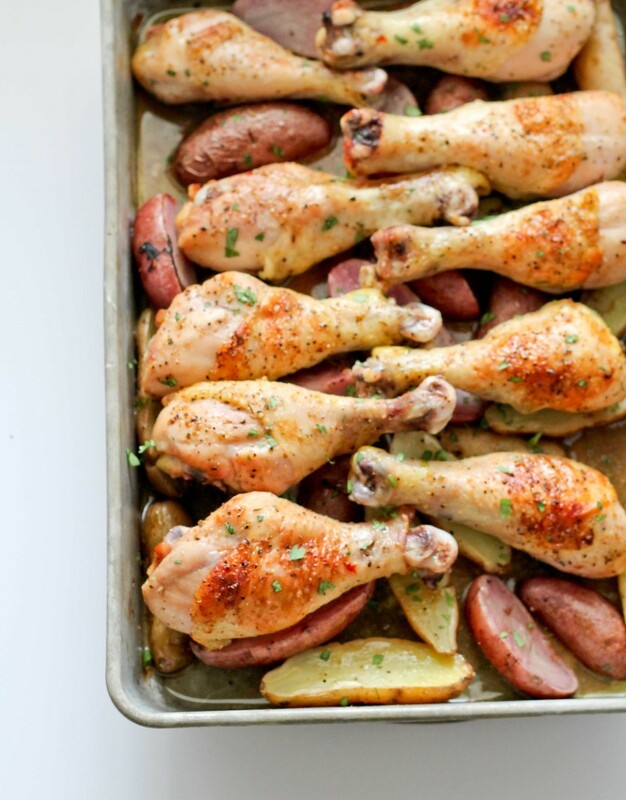 By marinating the chicken overnight with the Italian dressing the chicken legs where juicy and full of flavor; when the juices release during cooking it drips down onto the potatoes which soaks it up! Place chicken legs in a large resealable bag and add Italian dressing. Let marinate overnight. Preheat oven to 425 degrees. Cut fingerling potatoes in half length ways and place into a 13×9 baking dish; pour olive oil over the potatoes and toss. Next remove the chicken legs from the marinade and place on top of the potatoes; discard marinade. Sprinkle steak seasoning over the chicken legs and fingerling potatoes then place into a preheated oven and bake for 45-50 minutes or until chicken is golden brown and potatoes are tender. Garnish with chopped cilantro. Would definitely try this recipe again. Thanks! I didn’t cover it at all. What you can do is turn the oven up to broil in the last 5 minutes for it to brown, but keep an eye on it so it doesn’t burn.